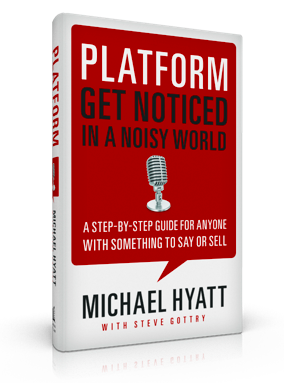 One of my clients recently asked if I’d read Platform – Get Noticed in a Noisy World, by Michael Hyatt. I had not; I promised her I’d buy a copy, so we could use the tips to help her promote a book she’s about to publish. The book arrived on a Friday, and by Monday night I’d finished it in just a couple of sittings — I definitely feel it was worth the money. “Michael Hyatt, one of the top business bloggers in the world, provides down-to-earth guidance for building and expanding a powerful platform. The summary above may sound a little daunting, since the social media space covers a lot of territory — and self-promotion doesn’t come naturally to many of us. But, the book is separated into digestible, skimmable, and actionable lists and sections. I took several pages of notes while reading, and kept getting excited about all the ways I could apply the tips, when helping different clients. From now on, whenever I have a customer who’s particularly interested in self-promotion and marketing, I plan to get a copy of Platform – Get Noticed in a Noisy World into their hands. Highly recommended.